In May of 1900, after only eighteen years of use, it was necessary to rebuild the entire structure to accommodate more weight and not because of any flaw in the prior construction. A new and sturdier structure was required to withstand the incredible weight of new trains and rolling stock. All traffic was prevented from crossing the viaduct on May 14, 1900, although the actual reconstruction did not begin until May 24, 1900. 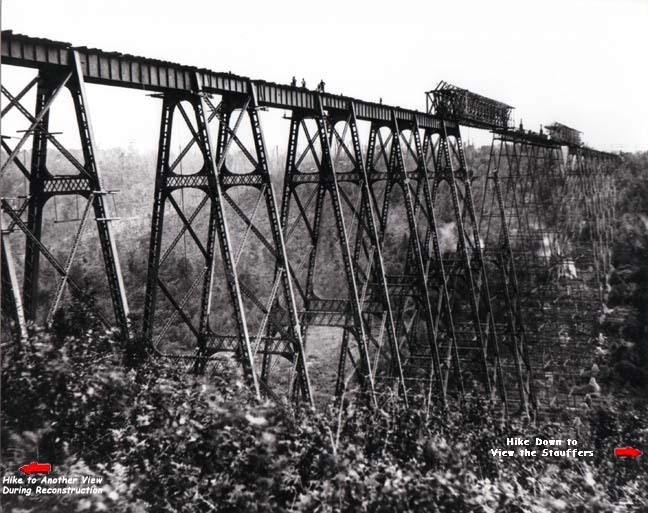 The last girder was up in place on September 6, 1900 and traffic began to cross the Kinzua Valley over the new viaduct on September 25, 1900. The job was completed in 105 days by about 100 to 150 men working ten hours a day. This in itself is impressive because during the construction there was a week long strike, the speech of a presidential candidate in the area, and a major forest fire that that began under the viaduct and burned two communities before being stopped at the edge of a third community. The new steel viaduct had the same measurements, but now weighed an impressive 6,715,000 pounds. The construction of the new viaduct was directed by C.W. Bucholz the chief engineer of the Erie and was carried out by the Elmira Bridge Company. The construction started on both ends and they worked towards the middle of the viaduct and with the use of two 180 foot timber travelers, which were both a complete Howe truss, that measured 16 feet in depth. The timber travelers spanned three towers and the middle tower was destroyed and then reconstructed of new steel and after the tower was finished the timber traveler moved on to the next tower and repeated the process. The skilled workers were able to move at a rate of 500 feet per month. They were able to demolish the highest tower and the adjoining spans in seven and one half days. There were thirty seven miles of rivet rod used in the construction of the second structure. Andy Stauffer, the son of the late bridge inspector Charles P. Stauffer, received the honor of removing the first bolt from the original structure and then driving the final gold rivet into the new viaduct. The new viaduct's supporting posts were of plate and lattice construction with measurements of twenty-four by thirty inches. The old structure's lattice work spans were replaced by girders. They measure five and one-half feet deep at the tower tops and six and one-half feet deep in the spans between the towers. Octave Chanute played a role in the engineering of both structures. He solved the problem of wind stress on the second structure by designing it to hold up against fifty pounds of pressure per square foot when unloaded and thirty pounds per square foot when loaded. The smaller pressure for the second figure was due to the fact that a pressure of thirty pounds to a square foot would be enough to blow a train off of the structure.